W&L Negotiations Team Wins Regionals, Headed to National Championships The W&L Law team of Thomas Griffin ‘18L and Stephen Edwards ‘18L will compete at the ABA National Negotiations Competition in February. 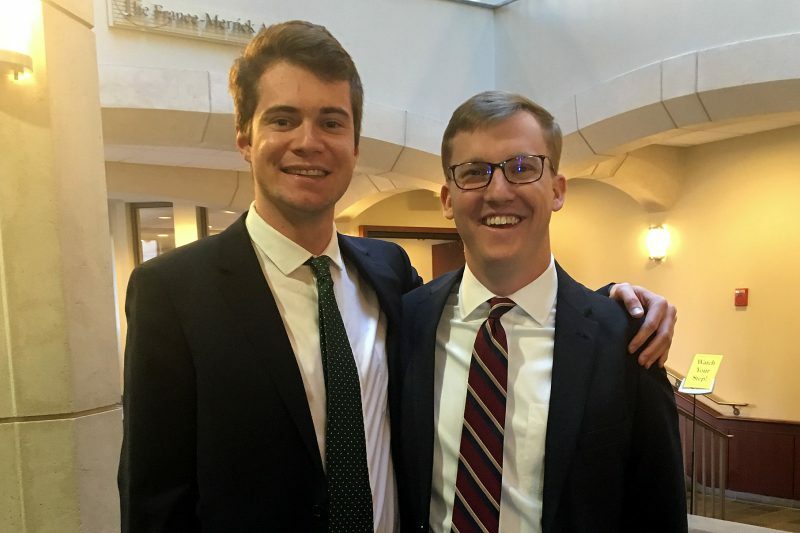 The Washington and Lee School of Law team of Thomas Griffin ‘18L and Stephen Edwards ‘18L will compete at the American Bar Association’s National Negotiations Competition, to be held in Chicago in February. The ABA-sponsored competition begins in the fall each year with school-based competitions, followed by regional tournaments. The competition tests students’ practical legal skills by emphasizing teamwork and the ability to solve disputes in a negotiation, pre-trial setting. Griffin and Edwards secured an invitation to Nationals following a first place finish at the regional competition held this month in Baltimore. At regionals, they topped 25 teams across three rounds of negotiations. At the national competition, the W&L team will face off against teams from law schools spread across the ABA’s ten student division regions. During the negotiations competitions, teams of students acting as lawyers for opposing parties receive confidential information about how they can best represent their clients’ interests. The teams work together in a limited time frame to find a compromise that is acceptable to both of their clients. Negotiation is one of several ABA-sponsored competitions that help students develop the kind of practice skills they will employ as professional attorneys. Other competitions include Appellate Advocacy, Mock Trial, Mediation, and Client Counseling. For more information about Moot Court at Washington and Lee Law School, please visit http://law.wlu.edu/mootcourt.